World War II is in full swing, and London is being hit with an air raid attack. After the attack, several people awake on board an odd ship with no knowledge of how they got there or where they’re headed. They were all planning to board ships for America before the air raid occurred, but this is not the ship that they expected to be on. What they don’t yet realize, but will soon discover, is that they were all killed in the air raid and will soon be delivered to either heaven or hell. An “examiner” is on his way to the ship, where he will determine each of their fates. As this realization that they have died comes to fruition one by one for the members of the diverse group, each of their life stories is slowly revealed. Edward A. Blatt directs the melodramatic fantasy Between Two Worlds. 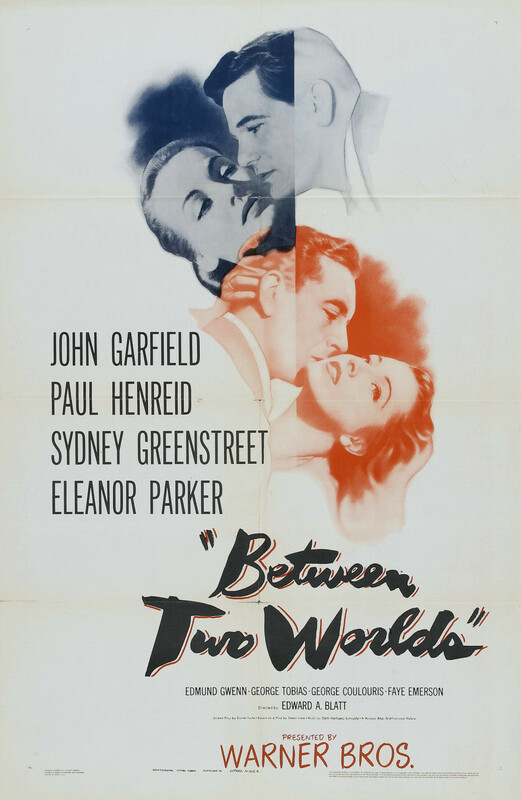 The cast includes John Garfield, Paul Henreid, Eleanor Parker, Sydney Greenstreet and George Tobias. The script was adapted by Daniel Fuchs (Panic in the Streets) from a play by Sutton Vane. Vane’s play also served as the basis for the 1930 film Outward Bound, starring Leslie Howard. Between Two Worlds is a film with some of the strangest mood-mixing I’ve ever seen. It is at times incredibly sentimental, but a certain level of eeriness is also maintained throughout most of the film due to the fact that the entire premise centers around a ship full of deceased people. It’s melodrama meets spooky exploration of death, with some romance thrown in for good measure, too. While odd, this mix is certainly engrossing. In combination with the slow reveals of each character’s personality and history, it makes for a film that’s difficult to turn away from. The fact that some characters are in on the truth before others adds to the sense of intrigue, too. The cast is enough to keep the viewer hooked as well. The film is full of incredible talent, and while the level of melodrama sometimes goes overboard (often due to semi-corny dialogue combined with an over-utilized but beautiful score), the performances themselves are solid. The stand-outs here are Paul Henreid and Eleanor Parker. [This portion of the review will contain a small spoiler.] The two portray a married couple who are the first to realize that everyone on the ship is dead. They’re able to learn the truth so quickly because they already know for a fact that they are dead: they committed suicide together. [End of spoiler.] Their story is heartbreaking and touching, and Henreid in particular gives a very sensitive performance that gives his character a strong emotional connection with the viewer. One of my favorite films although I have to say that Henreid leaves me cold, Eleanor Parker is much more affecting.. Everybody else is great and its hard for me to pick a favorite. If I had to choose I guess it would be Sara Allgood’s beautiful work as the kindly Mrs. Midget, a truly good hearted person but with enough pride and self awareness not to stand for being condescended to. I’m a huge John Garfield fan, I’ve seen most of his films and never a bad performance, he and Faye Emerson have a great sandpaper chemistry. The under appreciated George Tobias is so touching as a big lug who just wants to return home to his family. Isobel Elsom scores strongly as the haughty insensitive Genevieve, she’s not a nice woman but because of her skillful playing you still feel some sympathy for her, of course she’s aided in that by the gentle work of Gilbert Emery as her much more worthy husband. Then there’s the amazing Edmund Gwenn and Sydney Greenstreet, terrific separately and together. The little known Dennis King gives a small gem of a performance as the minister whose dream is to go forth and do good in the world and at the other end of the spectrum is the always dependable George Coulouris oozing slime as he did so well. You’re right the score does a great deal to set the mood but so does the simple staging. Just the silent fog sends off such a sense of isolation. Of course it also lends to a stagey feel but how could something on this subject be anything but. I will admit my pro-Henreid bias may have affected my review a bit. I think he was a very underrated talent, and I’ll watch him in anything. There is a lot to love about this film beyond his involvement though, as you’ve pointed out, and I’m glad to hear that someone enjoyed it as much as I did! Have you seen the earlier version of this film with Leslie Howard (‘Outward Bound’)? Curious to hear your thoughts on it if you have. Thanks for checking out my review! I haven’t seen it yet although it’s one of the ones on my most wanted list, along with A Bill of Divorcement and The Walls of Jericho, so hopefully TCM will run it sometime soon. If I ever do catch it I’ll definitely weigh in with my thoughts. Just the contrast between John Garfield and Leslie Howard in the same role makes the mind reel! TCM just ran it a week or two ago, so I’m not sure when they’ll run it again. Someone uploaded the entire film to YouTube, so you can find it there (for now, at least) if it doesn’t pop anywhere else. Unfortunately it hasn’t ever been released on DVD, so there aren’t many ways to watch it!